I recently spent a very enjoyable day at the British Museum, first delivering a paper at an OCR teachers’ conference, and then going to see the BM’s current major exhibition, Life and Death in Pompeii and Herculaneum, which it was designed to tie in with. Well over a hundred very engaged and enthusiastic teachers attended the conference, demonstrating the thriving current interest in Classical subjects at school level, and I’m pleased to say that they seemed to enjoy hearing my thoughts on the disparities in living standards at Pompeii and the tendency for elite houses to be surrounded like islands by smaller houses, shops and workshops. I certainly enjoyed sitting amongst them and hearing Alison Cooley showing the audience what stories the collections of writing tablets from Pompeii and Herculaneum can tell us about the lives and status of their inhabitants, Ray Laurence exploring the question of whether or not carts really made up much of the traffic in Pompeii, and Andrew Wallace-Hadrill sharing some of the important insights into life in Herculaneum which have come out of a project originally designed ‘just’ to conserve the standing remains. I allowed over two hours in the Pompeii exhibition before I would need to leave to catch my train, but in fact there was so much to see that I rather wish I had allowed three. Though I had a fair idea of what the exhibition would contain before I stepped through the doors, and had seen most of it before in books and on websites, I had forgotten just how much more you can get out of looking at even familiar art and artefacts in real life. I spent a great deal of time peering closely at items such as this painting of bread handouts and the full set to which this painting of gamers belongs, noticing details which I had never spotted before; or walking around this sculpture of hunting dogs attacking a stag and the various items of charred wooden furniture to fully experience their effect in three dimensions. 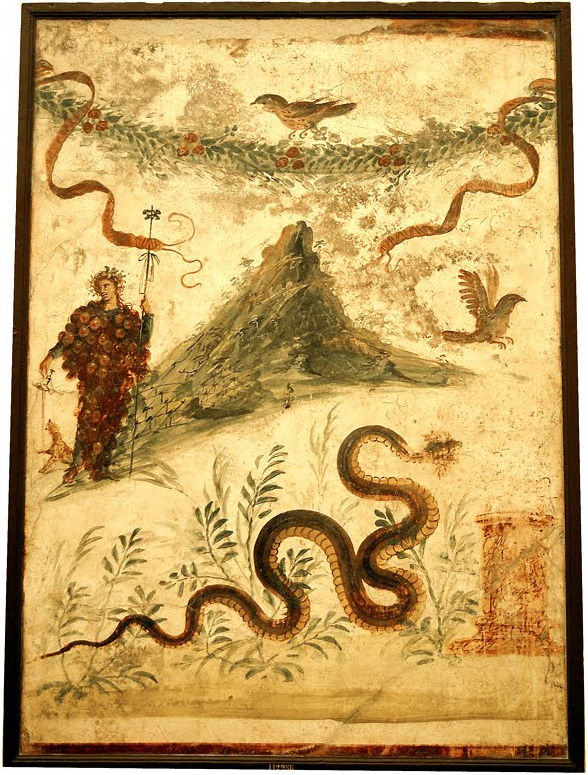 I especially enjoyed being able to read tiny painted or inscribed texts for myself, and realised for the first time that while the rest of the famous painting of Bacchus and Vesuvius (right) is in extremely good condition, the head of the snake is considerably worn – presumably because the inhabitants of the house where it was originally set up liked to touch it for luck as they went past. (Yes, snakes were considered lucky in the ancient world). It was also nice to see some recent finds, such as items from the sewer excavated by the Herculaneum Conservation Project. But although I enjoyed looking at the individual items, I found myself far less convinced by the way they had been put together. 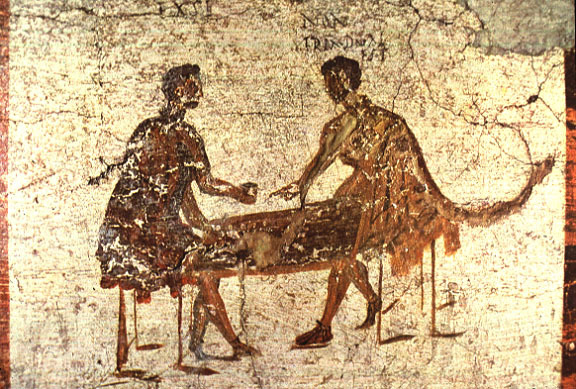 The publicity for the exhibition claims that it takes visitors to ‘the heart of people’s lives’ in Pompeii and Herculaneum, by focusing on domestic life. The items are grouped according to the rooms which they might originally have been used or displayed in, and the exhibition space is laid out to resemble the design of a Pompeian house (at least as far as the circular space of the old Round Reading Room allows). This is certainly a nice change from museum exhibitions which focus exclusively on the high art of the political elite, and it is a format which allows plenty of room for relatable everyday items such as oil-lamps, hair-pins, cooking equipment and jars full of ivory tooth-picks. The problem, though, is that the British Museum’s ‘house’ presents visitors with a kind of pastiche. It contains a medley of items which have actually been drawn from many different houses (and indeed public buildings, bars and streets) in both Pompeii and Herculaneum, which date from different periods and which come from different social contexts. Of course this is how exhibitions work. To really wow visitors, the organisers aim to collect together the most interesting, well-preserved and beautifully-made items from the culture or context which they are concerned with – and the contents of any one individual house from either Pompeii or Herculaneum could not hope to match what can be cherry-picked from multiple different houses on this front. But I felt that putting them together in way which mimicked the experience of moving through a single house implied that they genuinely all belonged together, and robbed visitors of the chance to fully appreciate the range of different living conditions which Pompeii and Herculaneum actually attest. Meanwhile, the same urge towards the spectacular has meant that in practice the contents of the exhibition reflects above all the lives of the wealthy. Yes, we do encounter freedmen and women, slaves, and people of more ordinary means. One cabinet, for example, displays the fine gold jewellery of the wealthy elite next to the cheaper imitations which most people would have worn instead, so that visitors can see the difference directly for themselves. 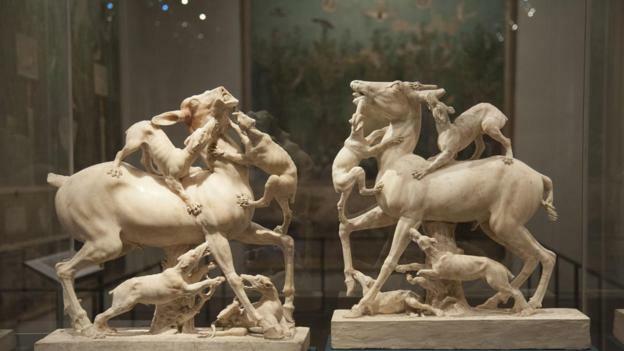 But the sheer preponderance of marble sculptures, fine wall-paintings, silver tableware and beautifully inlaid furniture, as well as the decision to organise the exhibition according to the layout of an elite house, creates the impression that a ‘typical’ Pompeian or Herculanean lived a life of luxury and splendour. Having just given a talk earlier in the day about the very different living conditions of the rich and poor in Pompeii, I found this very frustrating, and wished that the exhibition organisers had been more careful about it. I found myself imagining a rather different exhibition, in which the the ‘elite house’ experience had been shrunk down to make space for two more separate exhibition areas fitted alongside it – one showing life in a modest house of only a few rooms, and one going right to the bottom of the social scale to show us life in the back room of a shop or perhaps a poky upstairs apartment. They could even be linked together by a short section of street frontage, with doorways to all three opening off it, since people of very different social status really did live right next door to each other in Roman cities. All of the same items as are in the actual exhibition could still have been included, but dividing them up into different households would make the reality of life in Pompeii and Herculaneum much clearer, and counter the belief that ‘the Romans’ were a single homogeneous group who all thought and lived alike – something which I see all too often in student essays. For all that, though, the exhibition is clearly incredibly popular. It is already solidly booked out until the end of May, and is obviously attracting a really diverse range of interested visitors. While I was there I saw families, be-suited city workers, people speaking French, Italian, German and all sorts of other languages which I couldn’t identify, and all of them engrossed in the exhibits, pointing things out to one another and exclaiming over them with great interest. The audio guide and app are obviously both a great hit, and of course the exhibition has spurred a whole range of documentaries and events to run alongside it – included the conference I went down to contribute to. So although I can see room for improvement, I can’t fault the British Museum for connecting with the public, and I take my hat off to them for an exhibition which can only help to boost public interest in the Roman world. If you haven’t caught up with it yourself yet, you’ve got until September 29th to do so – but I recommend you make sure you have booked your tickets by at least the end of August. This entry was posted on May 6, 2013 at 10:32	and is filed under exhibitions, pompeii, reviews, roman art, roman cities, roman history. You can follow any responses to this entry through the RSS 2.0 feed. You can leave a response, or trackback from your own site. In case you are interested, here is a cute little music video about Pompeii…. A French version of the song is available here, although there is no French video…. Hey, thanks! I hadn’t seen that before but I really like it. I love the use of the old film footage, and the way the modern footage has been given a flickery, grainy, desaturated effect to match it. The harp is good for evoking ancient lyres, too, and I really like the singer’s voice. But it’s always nice to have more to add to the list.